The weekend warrior – have you heard the term? It’s a person who gets in all of their week long workouts during the weekend. This means instead of spreading out 150 minutes of moderate working out or 75 minutes of vigorous workouts during the week, you’re cramming it all in during your weekend. Let’s take a minute to examine the average week for an individual: At least 40 to 50 hours of work – the average work week is now at 47 hours – add on taking care of the kids and preparing meals, it can be exhausting. And we haven’t even gotten to paying bills, balancing checkbooks, and running errands. It can be difficult cramming in a much needed hour of exercise when you have all of your responsibilities and priorities to address Monday through Friday. This is why so many weekend warriors are taking advantage of two days off to get in their 150 minutes or 75 minutes depending on the workout. At B.O.S.S. Fitness, we urge those who want to live longer, healthier lives to invest in some time to exercise. As a fitness center, we know the importance of staying in shape and being the best version of yourself. This is why we offer a multitude of personal training appointments you can pick from. As a fitness center, we want to make sure you pick the best times for your workout, which is why we allow you to book anytime that’s convenient for your Sunday through Saturday. The weekend gives you time to just do whatever you want to do. Granted, if you have children or other responsibilities, the weekend might not be so flexible, but you still have some time to squeeze in for yourself. The weekend is a great time to relax and rejuvenate your body and mind from the week. The best way to relax and really take the time to enjoy your weekend is with exercise. 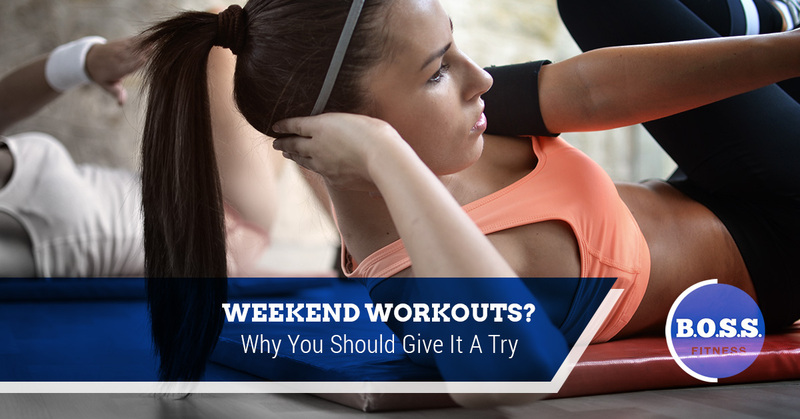 Even if you exercise during the week and love it, working out during the weekend can be just as great. You can pick the time and place, you can workout without any restrictions, and you can workout for however long you want to without worrying about getting work done or fitting in a shower. Being a weekend warrior might sound hard with figuring out how many minutes to workout to get your weekly dose in and finding the time, but it can ensure you are able to prioritize, keep responsibilities, and fit in all of your daily activities without worrying about staying in shape. How do you like to exercise? If you like intense workouts – this means you can’t talk while you work out – then you need to do 75 minutes on the weekend to make up for the week. This can mean 75 minutes of running, biking, aerobics classes, swimming, playing a sport, basically, anything that gets your heart rate up and leaves you sweating viciously. If you enjoy moderate workouts, then you need to fit in 150 minutes during the weekend. That’s two yoga classes and an additional 30 minutes of weight training. When you come to B.O.S.S. Fitness, we can help you figure out the best routine for your weekend. Our classes are also a hybrid of moderate workouts to intense workouts. For instance, Body Pump or Cardio Kickboxing combine cardio and weight training. Become a weekend warrior at B.O.S.S. Fitness!